The yoghurt produces a cake that’s both moist and quite dense in texture – it’s great as a teatime snack or you could serve it as a dessert with a little cream or more yoghurt. 1. Preheat the oven to 180°C, gas mark 4. Grease a 900g loaf tin and line the base with baking parchment. 2. In a large bowl, whisk together the oil, yoghurt, caster sugar, eggs and vanilla extract. Gently stir in the flour, baking powder and apricots to make a thick batter. 3. Pour the batter into the loaf tin and bake for 50–55 minutes, or until a small knife inserted into the middle of the cake comes out clean. Allow to cool slightly before removing from the tin and then leave to cool completely on a wire rack. 4. Mix together the icing sugar and enough lemon juice to make a thick icing. Drizzle this over the cake, scatter over the pistachios (if using), then slice and serve. 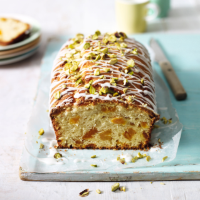 Make this cake nut free (and even prettier) by replacing the pistachios with a sprinkling of Waitrose Cooks’ Ingredients Rose Petals or Waitrose Home Baking Freeze-dried Raspberries.